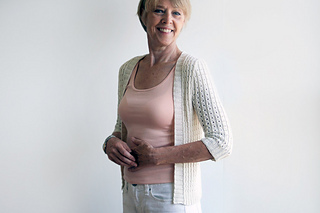 Mrs. Donahue – is the latest in my style series, positioned somewhere between a cardigan and a shrug! This high‐hip length design, slightly shaped at the waist, is worked from the bottom up, in one piece until the armholes, where its fronts and back split and each are worked separately. Half‐length sleeves are worked bottom up, in the round, and set‐in. Row tracking grids for both bodice and sleeves make the knitting of its overall 2x2 Rib Lace texture a breeze. Stitches are picked up along the center fronts and back neckline for rib trimming. Enjoy! FINISHED MEASUREMENTS – This pattern is designed to fit the following body measurements (without ease). Note that the actual finished measurements for bust, waist, and hips will differ from these since its center front edges do not meet. Shown in Willet by Quince & Co. (100% cleaner cotton; 160 yds /146 m per 50 g skein); color – Sail #701; 5, 6, 6, 7, 8, 9, 9 skeins, or for comparable yarn, approximately 765, 870, 975, 1070, 1200, 1320, 1425 yards / 700, 795, 890, 980, 1100, 1210, 1305 m.
Long-tail cast on, circular knitting, decreasing (skp, ssk, k2tog, p2tog), increasing (m1L, yo), 3-needle BO, short row shaping, setting in sleeve caps, stitch pick-up around neckline/center front, and blocking. 14 page pdf includes pattern instructions, photographs, schematics, tutorial links, bodice and sleeve row tracking grids for managing Lace stitch pattern while shaping, and definitions for relevant abbreviations. See related blog post for name source here!